Collinsville High School and the Illinois Department of Employment Security are hosting a career fair at CHS on April 24, 2019 from 3:00 to 5:30 pm. The event is FREE and open to CHS students and community members. 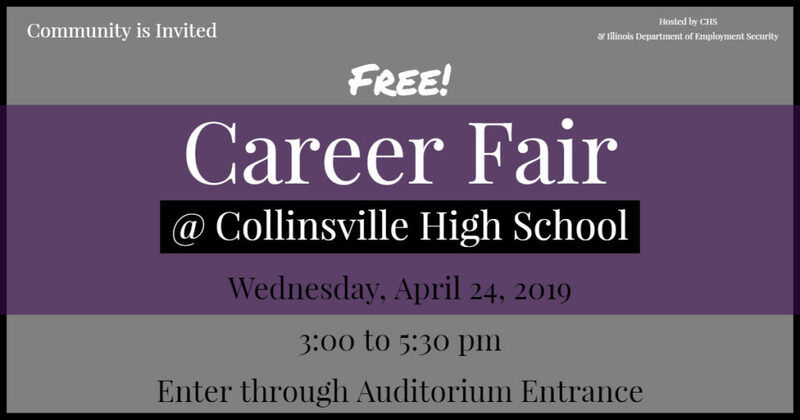 The career fair will be held in the Auxiliary Gym at Collinsville High School. Attendees should enter through the auditorium entrance. Employers from a wide variety of fields will be present to speak with and possibly interview candidates. All skill levels and ages are encouraged to attend. Click HERE for a printable copy of the event flier. Also, on April 24, 2019, the Collinsville Area Vocational Center will hold an Open House for interested parents or students from 5:30 to 7:00 pm at the Vocational Center. Members of the Collinsville community or others served by CAVC are welcome, too. Kahok Academy will host an Open House at the same time. Kahok Academy is CHS’ special program to help qualified students recover high school credit and work toward graduation. For more information, contact Carla Elliff at celliff@cusd.kahoks.org.